← Goat cheese fig flatbread and saying goodbye. I love September because I have a totally legitimate excuse to play this song as many times as possible. In the absence of an actual playing device, I let it play in my head for the entire month, as my soundtrack to the month that is its name. I love September because it means FALL IS COMING. Don’t get me wrong — I would sell half my plasma for more summer, but only so long as I can stay out of school. Once school and work start back and I am absolutely beside myself for fall to come. I know it doesn’t get into full swing until October (or never, if you live in one of those sad seasonless regions) but it starts in September. And fall means crisp evenings, homemade pumpkin donuts, bright leaves, scarves, hats, and yummy apples. I love September because it means the return of salted caramel products at Starbucks. Pumpkin spice — you have NOTHING on salted caramel, and I just don’t even care that it is your tenth anniversary or whatever. One time I tried to buy the entire canister of salty sprinkles but the barista refused to ring it up. I have henceforth considered stealing it off the espresso machine every single time I go in a Starbucks. During the summer months I consoled myself by downing as much Talenti salted caramel gelato as our budget and waistlines could handle, but I am eager to welcome back my favorite drink just in time for my long Saturday homework Starbucks binges. I love September because it is my birthday month, and I am still just juvenile enough to be excited about it all month long. We celebrated with an early party last Friday and will celebrate the actual day this week. This means that I have been eating birthday cake directly from the platter for breakfast every day since. 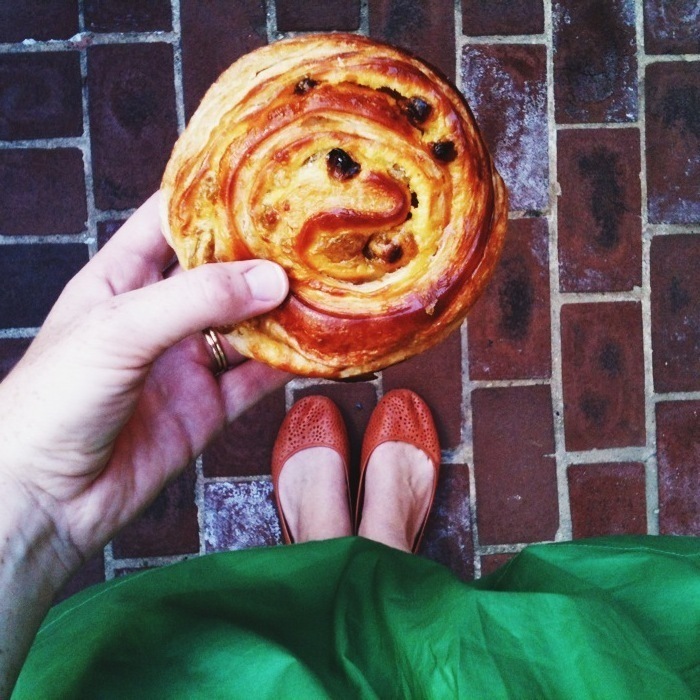 I love September because it means I am back to going to the UMD farmer’s market on Wednesdays to buy delectable French pastries from the pleasant Hispanic man who sells them alongside awesome empanadas. James and I have started our own Health Initiative that has cut out most of my awesome snacks and replaced them with carrot sticks and exercise, but I am holding on to my weekly pain au raison with the iron grip of someone who worries that the Gluten-Free craze will eradicate all yummy bakeries. I love September because it means new school supplies. Yes, I wish I was still spending all day in my pjs watching BBC miniseries (Call the Midwife anyone??? I am now both fascinated and repulsed by childbirth.) all day, but there are few thrills as great as a crisp new notebook, waiting to be filled with intriguing thoughts and complex doodles. I have a pretty heavy course load this semester, but me, my trousse, and my pristine notebooks are read to take it on. Plus, I begin every semester with a renewed zeal towards excellent penmanship, one that will undoubtably take a hit throughout the semester. But for now, it’s September, and all things are fresh and new and possible. 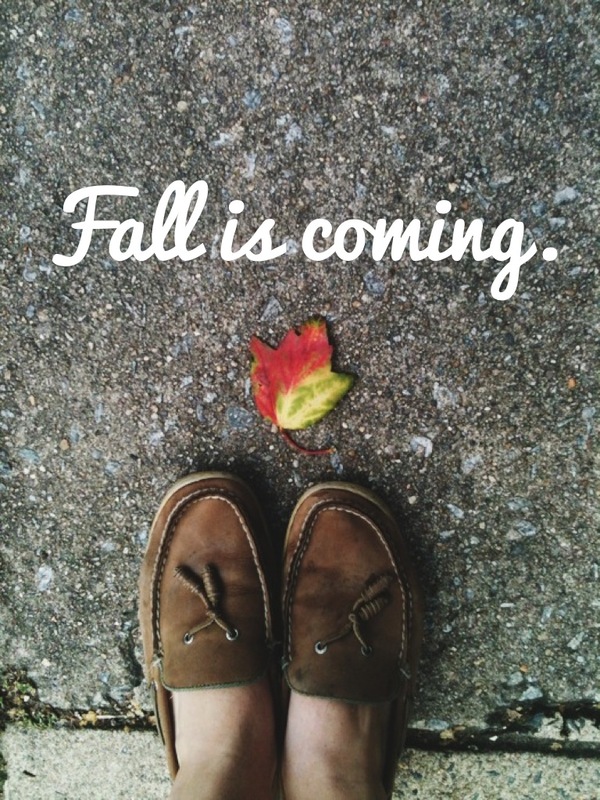 Anyone else excited for September and fall? This entry was posted in Uncategorized and tagged fall, iphone pics, lists, seasons. Bookmark the permalink. 37 Responses to I love September. I love September too, for pretty much the same reasons that you listed above (except that Pumpkin Spice still wins out over Salted Carmel for me!). Fall is in the air in Oregon and it makes me SO happy! And regarding your reference to homemade pumpkin donuts…recipe please?!? Oh, yes, I love September, too! It has much more of a new year feeling than January 1, even though I’m not on an academic schedule any more. We’ve had delightfully brisk weather last week, but this week will get to the 90s. Bluh. I just heard about the 90’s weather about to hit DC and I am in denial — so much so that I might wear a scarf tomorrow. And YES to academic new years!!! So, the Earth, Wind & Fire song. I just will always be obsessed with it. The morning of my wedding was cold and rainy, and it was cozy in our house and my mom woke us all up for breakfast that morning by blasting that song throughout our house 🙂 And we danced it it at our reception that night. Also, it reminds me of Dan in Real Life (a favorite fall movie). All of that to say, I CONCUR WITH THIS WHOLE POST AND I AM READY FOR THE TEMPERATURE TO DROP NOW. This is yet another reason why we are kindred spirits. That sounds PERFECT. In fact, now that you say it I think I remember reading about it and clapping my hands in excitement. YES. Love September and all things Fall. I do get sad that summer is over, but less so now than I did when I was in school haha. I love the changing seasons and don’t think I could ever live in a place that was the same year-round! Also, Call the Midwife is the bomb.com. Loved that miniseries. I think you’re the only other person I’ve met who actually watched it, too! It is soooooooo good. My bestie from college got me hooked. In the final episode of season 2 I was weeping as you know who and you know who else got together. Forget Mary and Matthew — their’s is the true miniseries love to root for! Fall! The most anticipated & yet somehow the quickest season. 😉 I’m excited that we have a few more hot days left in the forecast in Iowa but that sweater & coloured jean & hot drinks in the mornings are juuuust around the corner. I’ve already decided that there aren’t enough weekends between september & october & could we raise it just a few, please? YES. Let’s get this plan rolling. I have always said that I would trade March for a second October. We are approaching summer down here in the southern regions with much anticipation. As a Starbucks frappuccino connoisseur I am interested in your salted caramel products. Have never seen them here in NZ. Also love Call the Midwife. I have all four of her books – well worth reading. Far better than the tv series. I need to read the books! I cry in almost every episode because something always gets me just right at the end. 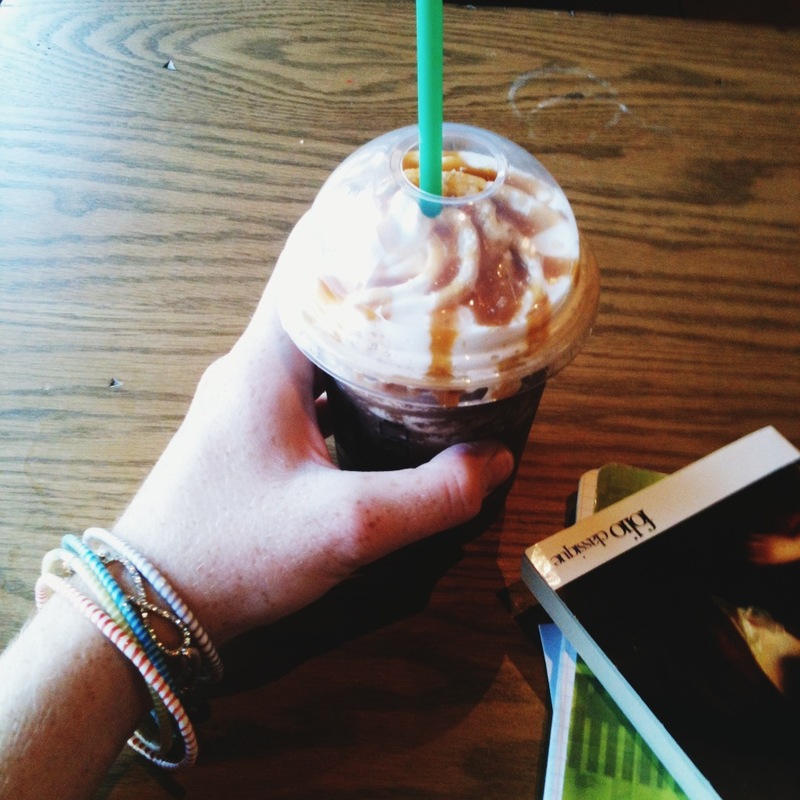 It is absolutely imperative that you locate a salted caramel frappuccino. They sell Starbucks packaged salted caramel hot chocolate mix in stores here and I make it up with additional salt sprinkles on top. I hope you can find some!!! Hooray!!!!!! I was seriously contemplating ways to mail you one, and none of them seemed plausible. 🙂 enjoy!! New boots!!!!!! The story of my life is a search for them. I think though that this could be the season when I finally find them. I’m a big fan of fall… and birthday cake for breakfast. So glad to hear I’m not the only one! Um, yes. Because added to the delightfulness of being home now is cool weather and being home, which means me and the baby can (comfortably) enjoy playing outside. And also, he’s turning 1. He CANNOT be 1 already. It just isn’t possible. I love Call the Midwife! I like that they portray childbirth as hard but normal, unlike most TV shows that are all OH NO THE BABY IS COMING SO MANY COMPLICATIONS LET’S BE TERRIFIED!!!!! Guess I should get the books too. True, although I was super traumatized by the enema until someone kindly told me that we don’t do that anymore. Oh I love September, too, for nearly all the same reasons. And once I listen to “September” and perhaps catch an episode of Call the Midwife and celebrate my birthday tomorrow, it’ll probably be the exact same reasons. And here I thought I was the only one who actually rather preferred salted caramel anything. Okay, no matter how many times I listen to “September,” I forget the words and get annoyed that it’s stuck in my head. Oh well. I basically sing “ooohhhh aahhh ohhh da da da SEPTEMBER…” and stuff like that. It works. It’s just the BEST EVER!!! I got so excited when I figured out that I could buy salted caramel Starbucks hot chocolate mix at the grocery store, and I am pretty sure that it was solely responsible for the weight I gained in the first year of marriage. Whatever — totally worth it. Huzzah for September! The first weekday of September hit and I was already putting up my facebook post of loving all things pumpkin spice, crunchy leaves, vibrant colours and the art of layering (for us Canucks here in the North 🙂 and too many people booed my embrace of September (aka Autumn! )….Oh, and Happy Cake Day to you! I have seen enough of you website. I simple Love it and I will share especially this post . I have just discovered your blog, when my daughter dropped me a link and asked me to read the entry “my husband is not my soul mate” and I thought it was great but it made me really think! I love that at 50 I am still open to enlarging my thoughts to others view points!! Any way I’ll be following you and reading other I’m sure, great and interesting topics. I just wanted to say hi!!! That’s why I love september also! Each september so many memories appears! Very nice written!